Bibliography: Bartsch 56; Hind 266; White and Boon sixth of seven states. 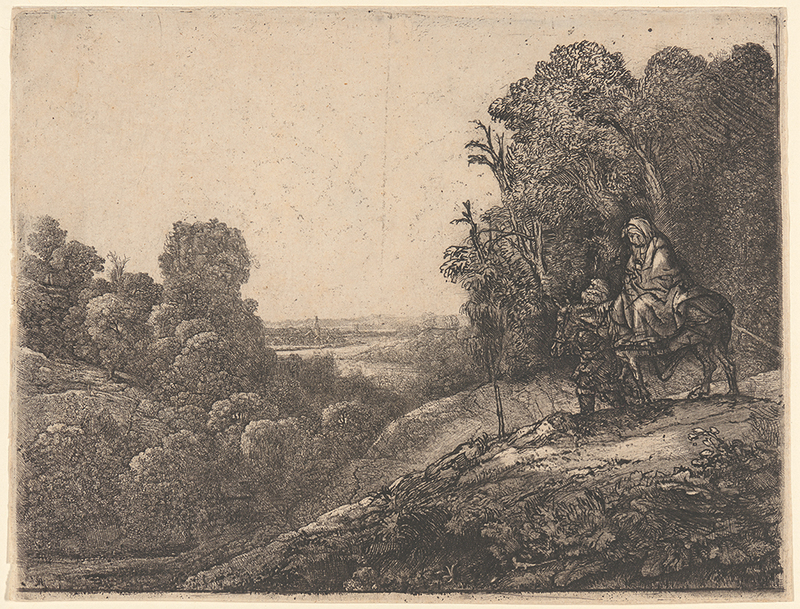 Related Works: Worked (altered) by Rembrandt on a plate from Hercules Segers; the plate had two figures representing Tobias and the Angel, one taken from H. Goudt’s engraving after Adam Elsheimer. The Flight into Egypt, . Etching, engraving, and drypoint on laid paper. Sixth of seven states. Plate: 212 x 281 mm (8.3 x 11.1 in.). Sheet: 216 x 286 mm (8.5 x 11.3 in.). DAC accession number 1941.D1.30. Gift of George W. Davison (B.A. Wesleyan 1892), 1941. Open Access Image from the Davison Art Center, Wesleyan University (photo: R. Lee). http://dac-collection.wesleyan.edu/obj11994 is a persistent link to this page with no user-session information.